The Rass Collection MFL-2508 Henley T-shirt is one of those men’s tees that you'll wear again and again. Versatile, durable and oh so comfortable, it just might be the world's most perfect t-shirt. - ULTRA SOFT. You simply can't beat the softness of authentic Peruvian Pima Cotton. - BREATHABLE. Natural cotton lets air reach your skin to keep you cool on hot days. - FORM-FITTING. The addition of Spandex provides a flattering fit and allows the fabric to hold its shape. - DURABLE. Like all of our men's tee shirts, the MFL-2508 is made to last at our factory in Peru. You can wear the Rass Collection MFL-2508 Henley T-shirt with jeans and shorts for a casual look or dress it up with khakis. The Rass Collection MFL-2508 Henley T-shirt is very easy to care for due the durability of its fabric. Simply machine wash on the Normal Cycle. Do not use bleach. Look stylish and feel great for any occasion in one of the best tee shirts on Amazon. 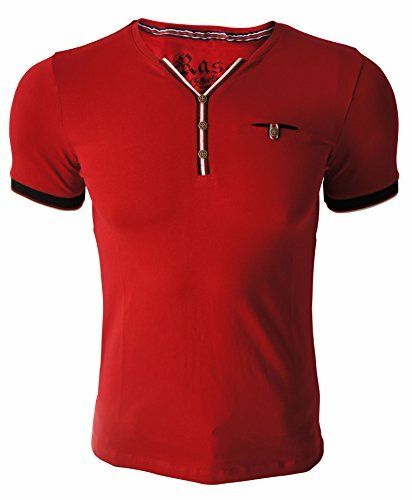 Choose the color you prefer from our four available options and order the Rass Collection MFL-2508 Henley T-shirt now.